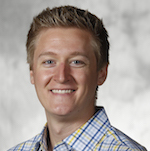 Josh Blessing serves as senior producer of Gopher Digital Productions, Gopher Athletics' video production unit. He produces day-to-day video content for all Golden Gopher varsity sports, as well as serving on the production team for live big screen events at TCF Bank Stadium, Mariucci Arena, and Williams Arena. Blessing also oversees all Olympic sport intro videos. A native of Wakarusa, IN, Blessing earned a bachelor's degree in journalism in 2013 from Ball State University, where he worked as a student at Ball State Sports Link, the university's athletic video production unit. During this time he covered the 2012 London Olympics and the NCAA Men's Basketball Tournament for three years. He currently resides in Minneapolis, MN.